This model is discontinued. 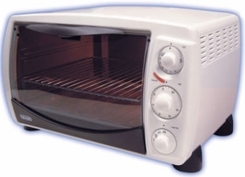 As an alternative, we recommend the DeLonghi AD1099 Solo Convection Oven with Rotisserie. UNIQUE "HEAT CIRC" TECHNOLOGY along with dual heating elements enable the twice-heated air to be displaced over the food more evenly and more directly, which can reduce cooking time up to 20%. 2-HOUR TIMER with safety auto shut-off. MULTIPLE COOKING FUNCTIONS including bake, bake with convection, broil, keep warm, defrost and rotisserie make this the ideal multi-function oven. OTHER ACCESSORIES INCLUDED: 2 cooking racks, low-profile DuraStone enamel bake pan, rotisserie kit and DuraStone enamel rotisserie pan. Dimensions: 21" x 16.25" x 12.75"